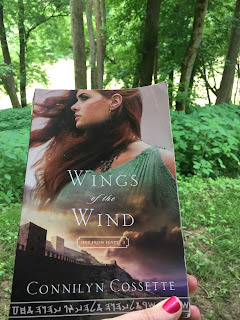 Last week, on the banks of the Kentucky River, I read Connilyn's latest book. I have to tell you, I always enjoy her work. I don't think it is exemplary writing that draws me in. Sometimes I have questioned how a quick plot change came about. I just roll with it because her stories are good and redemptive. They are well researched. The most beautiful thing I pull from them is that they are infused with a rich love of God's word. Watching her characters conform (or not conform) their lives to God's teachings gives this new longing to know it more. It's not just doing what is right, but a love of honoring God and cherishing life. She clearly shows the exquisite compassion of God's character. Every single time I read something she has written, I am deeply thankful that God has given us his word to shape our lives. We are no longer bound to the sinning in ignorance. I think we can often forget what a miraculous gift this is. Thank you for the reminder, Connilyn. This book, Wings of the Wind, was written from the perspective of a person who was rescued by the Hebrews in their desert wanderings after Egypt. I thought this was such a unique viewpoint because you could see how foreign good and godly things are from the pagan culture. It gave a picture of how long and hard it is to win the trust of someone who is not used to the loving attributes of the people of God. Foreign practices were also showcased in some of the chapters so you could get a clear picture of the stark contrast between the divine and the demonic cultures. I enjoyed reading this and have been encouraged by the story. I left my copy at a tiny house in the woods of Kentucky hoping the next person who comes across it will hear the gospel in it. Thanks to Bethany House Publishers for graciously providing this book for review. Read more about the book description and Connilyn on Amazon.